Gucci Rush was created to express the impulsive and irresistible attraction for someone and this perfume often inspires the wearer to love it at first sight! Gucci Rush perfume is a lovely mix of woody oriental notes with a hint of mango and other exotic fruits. It begins with a fresh burst of mango and passion fruit, built over a lighter heart of jasmine and other fresh flowers and a base of vanilla and sandalwood. Gucci Rush is the perfect modern and contemporary fragrance statement. 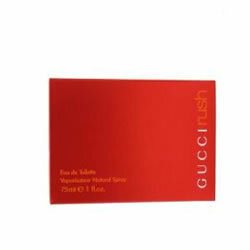 Gucci Rush perfume is a lovely mix of woody oriental notes with a hint of mango and other exotic fruits. It begins with a fresh burst of mango and passion fruit. Narciso Rodriguez's first fragrance For Her EDT is a lighter interpretation of the passionate EDP For Her fragrance. It has an elegant, sensual, mysterious and delicate essence, that is slightly brighter and softer than the original parfum version.